Bangkok, Thailand’s capital, is a city full of surprises. Bangkok is a vibrant city known for its vibrant street life, busy roads, buzzing markets and beautiful temples. 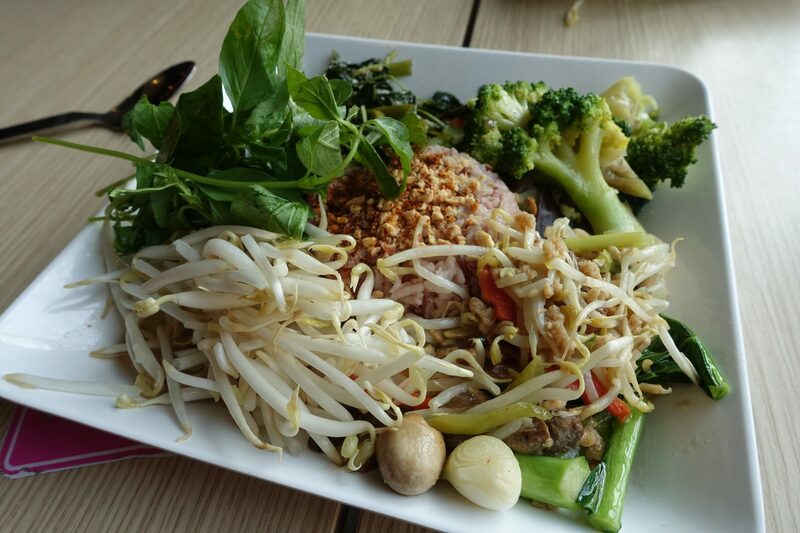 In this post, I am going to share with you my favorite spots to grab delicious vegan food in Bangkok. As always, I aim to share with you only places that are considered affordable, by local standards. This was, hands down, my favorite places to grab vegan food in Bangkok! On the fifth floor of the Terminal 21 mall is a massive food court called “Pier 21”. Head to the fifth floor and look for the stall with the number “15”. It’s simply called “Vegetarian Food” and they offer stir-fries, curries, tofu dishes and mock meats. Bear in mind that it’s a vegetarian food stall and egg is used in a handful of their dishes. Make sure to specify that you don’t want egg and you are good to go. Prices for food range from 27 to 40 BHT. 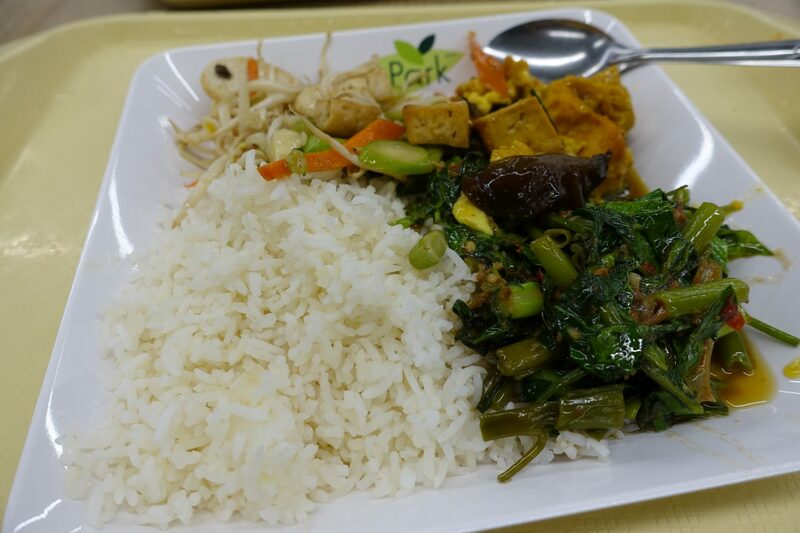 I chose 3 vegetable dishes with rice for 40 BHT. After you get your food you have the option of adding bean sprouts, peanuts, chili flakes, pickled vegetables, and basil. The food was really good, not too oily, and the portion size was perfect. Check out Happy Cow’s reviews to get an even better idea of the place. 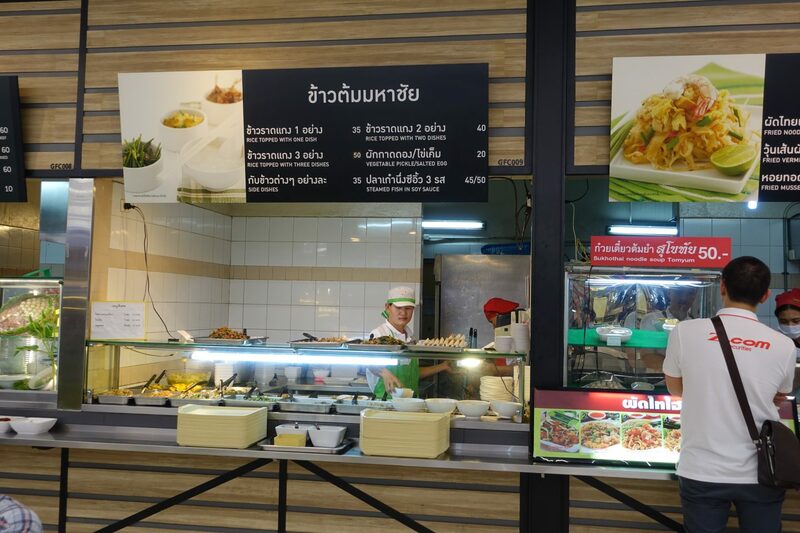 Mona’s Burmese Food stall is located in the heart of the Phra Khanong market, home to Bangkok’s Burmese community. I had food there back in 2014, on my first visit to Bangkok and have been craving it ever since. 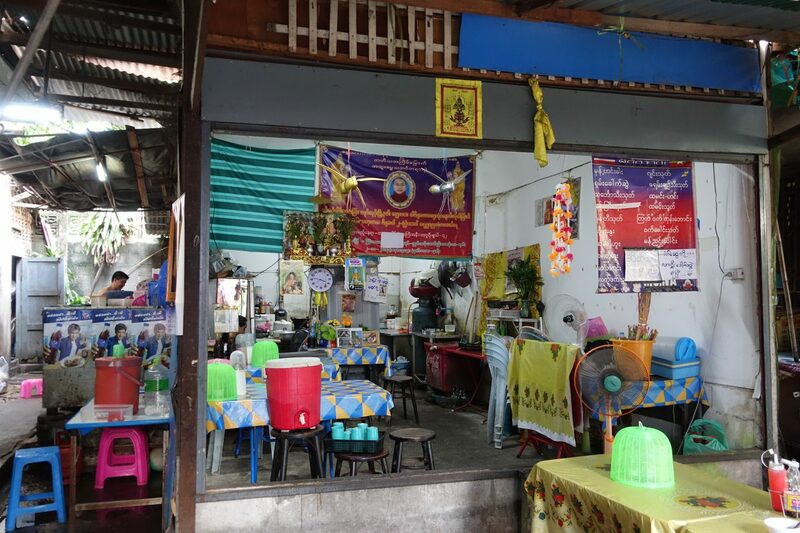 It’s a small, family-run food stall that cooks up delicious Burmese food. While only some of it is vegan, most meals can be made vegan upon request. Just make sure to bring a note stating your dietary preferences in Thai or Burmese with you as it’s a little hard to communicate in English. I went on a Thursday for lunch and there was only one dish (Khao Swè Thohk) available. Luckily for me, a lovely lady who happened to have food there helped me out and communicated to Mona that I’d love for my food to be vegan. 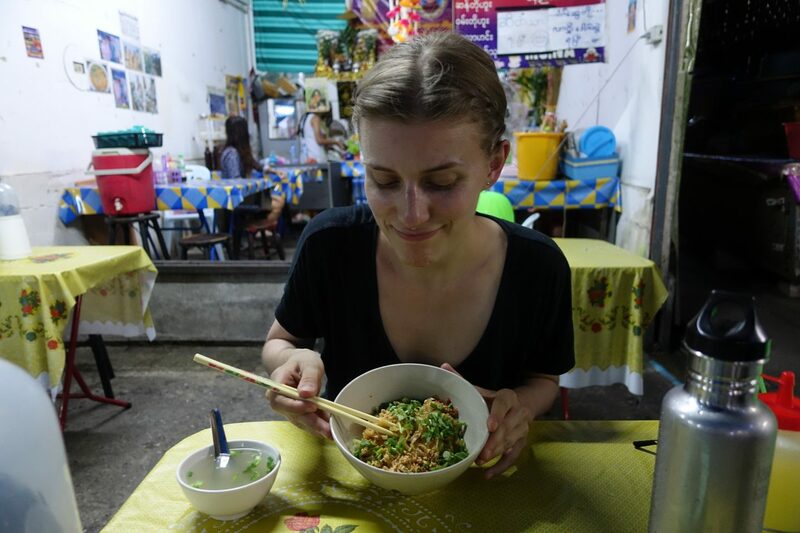 Shortly after a bowl full of Khao Swè Thohk for 50 THB came and it was one of the best meals I had here in Bangkok. 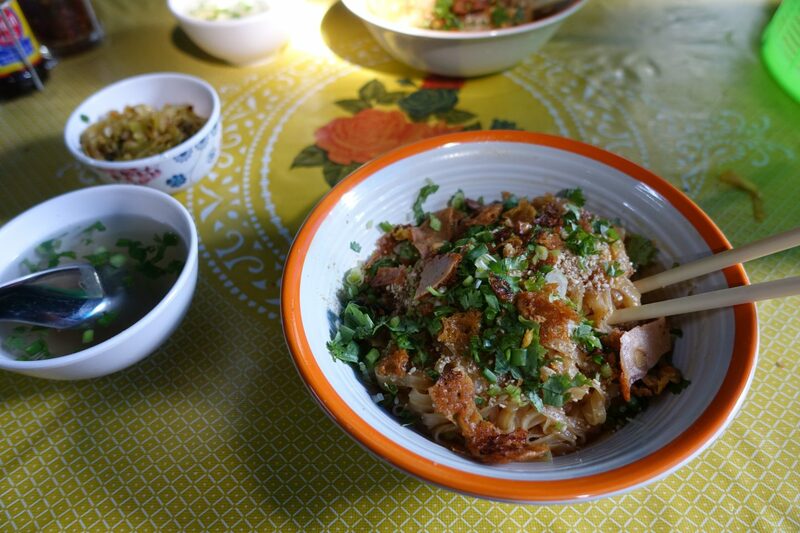 While Mona’s Burmese food stall can be a bit tricky to find, make sure to hunt it down. The food is so worth it! Read this post for more information about this beautiful place! Inside the Big C is a huge food center with a variety of food options and while there isn’t a vegan stall, there’s a stall with heaps of vegan options. The stall’s number is “GFC009”. Have a look at the below photo, you really can’t miss it, it’s right in the middle of all the stalls. When ordering just make sure to say that you don’t eat fish, meat, fish sause, egg and the like. The person on the day I went spoke english and was able to show me all the vegan options. To my surprise roughly 1/3 of the food was vegan! I went for the rice topped with three dishes for 50 THB and it was delicious. There are a whole bunch of coconut ice cream carts all over the city. I happened to stumble upon one at Chatuchak Market. 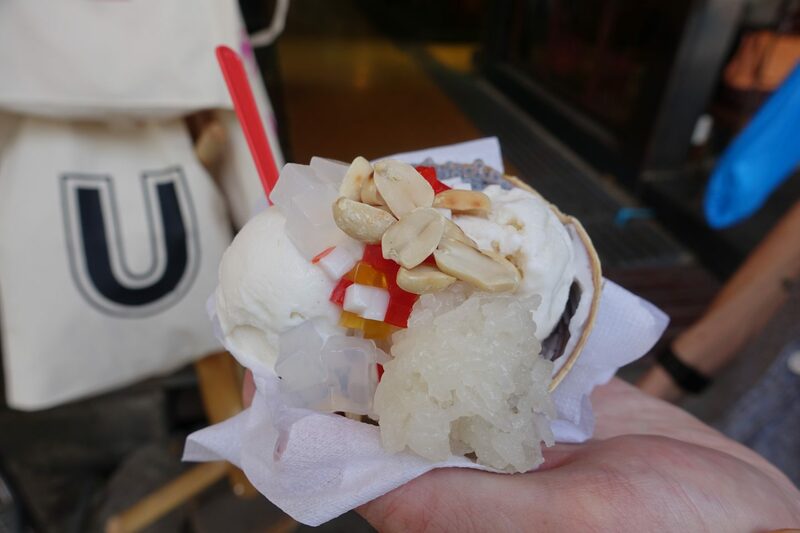 The basic ice cream is usually between 30-50 THB and after you get it you can add a whole bunch of toppings (free of charge!). If you spot one of the stalls, give it a go – it’s delicious! While these buns are definitely not the healthiest, they are so good. To my surprise a handful of them are vegan and I loved grabbing these whenever there was nothing else around. You can find them at most Family Marts and 7/11’s. They are usually between 9 – 10 THB. 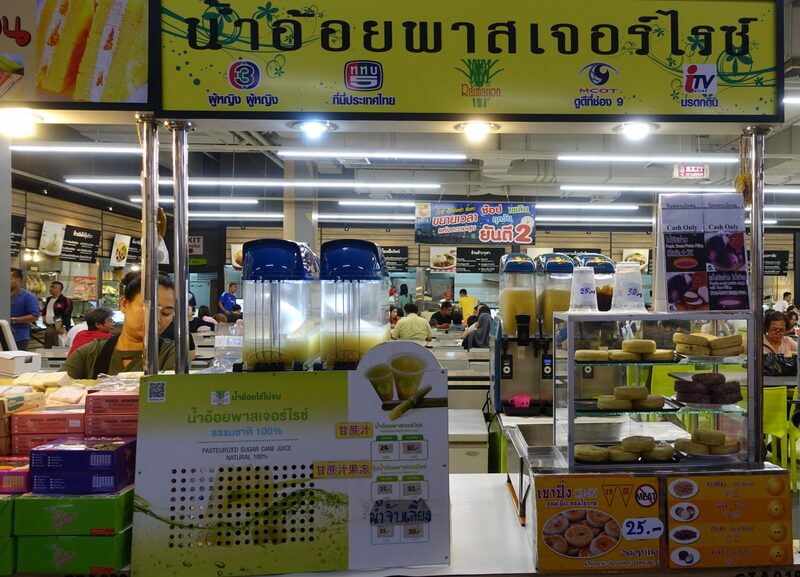 I randomly stumbled upon this place as I was looking for food at the food center at the Big C Extra Ratchadaphisek. Upon asking about it I got informed that the buns they are making are vegan. 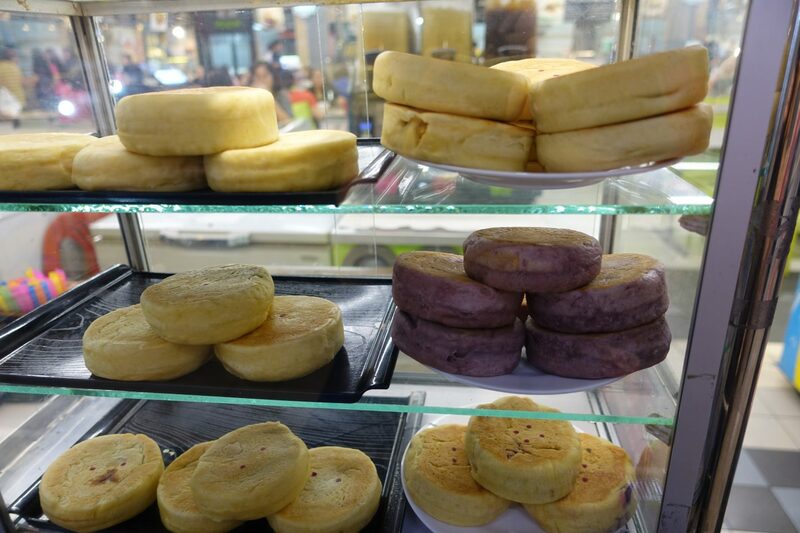 They have chinese savory pancakes with soybean, taro, red bean and coconut for 25 THB each. When you order your pancake it’s being warmed up for you. 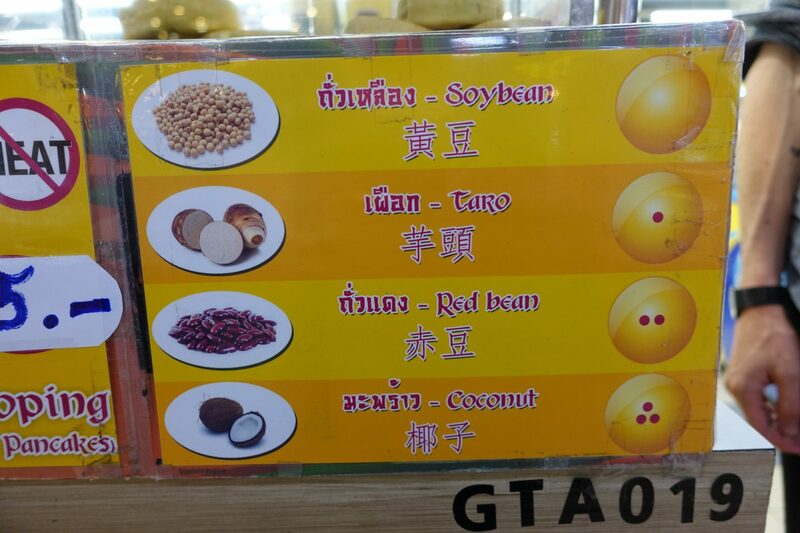 I went with red bean, as usual, and it was wonderful. 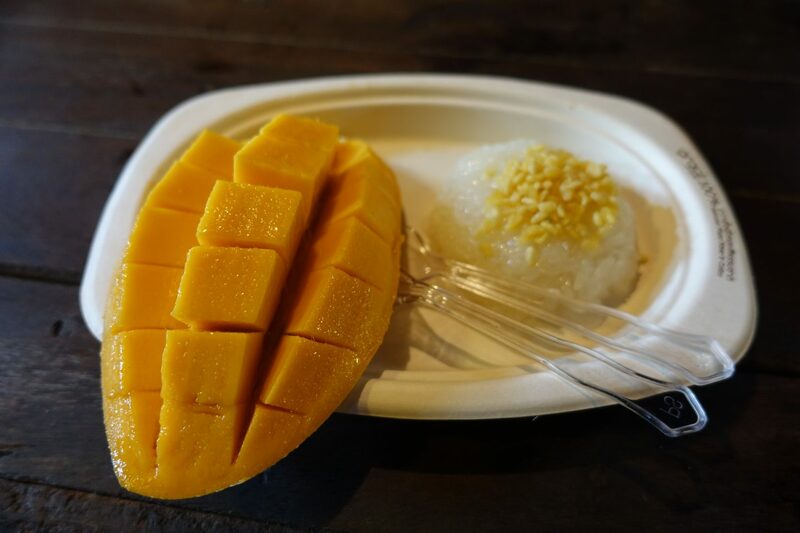 Mango with sticky rice is one of my favorite desserts ever. It’s made with sweet sticky rice, coconut cream syrup and mango on top. Depending on where you get it it’s usually between 40-70 THB. 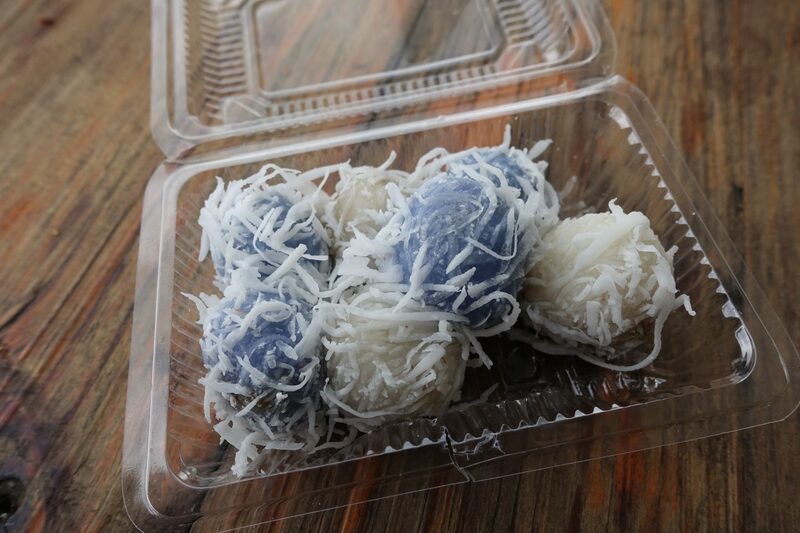 Khanom Thom is usually made out of rice flour, coconut milk, water, sugar, and coconut. 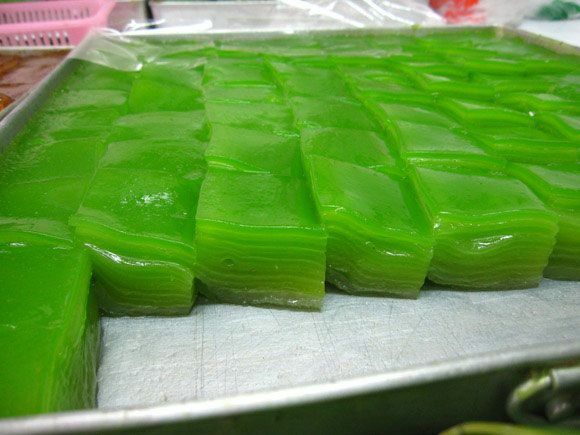 It’s one of my favorite desserts ever and if you happen to spot it at the market, give it ago. I got mine at Ko Kret market. You can find Khanom Chun at almost every market and most varieties are vegan. Khanom Chun is usually made out of coconutmilk, sugar and flour. The ingredients are mixed together and then left to harden. This is my favorite grocery store in Bangkok. I ended up staying in Nonthaburi, which is just outside of Bangkok, and there was a Big C super close to my apartment. What I love about Big C is that a lot of fruits, vegetables, and bread gets discounted in the evening. Go after 6 PM for the best deals! Big C was my go-to spot for grabbing fruits and vegetables because they are reasonably priced, their selection is huge and most of it is local. If you are in Bangkok, go to Big C Extra Ratchadaphisek. It’s gigantic! Sustaina is a small organic store with a restaurant. 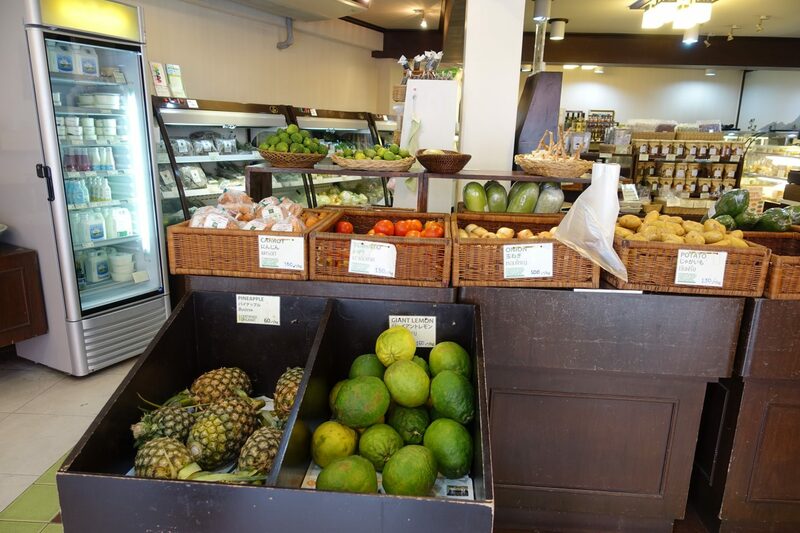 The store sells body care products, fruits, vegetables, homemade soap and heaps more. What I love most about this store is that lots of their sweets and offerings are vegan. While it’s a little pricey it’s so worth checking out! Gourmet Market has heaps of locations in Bangkok and I highly recommend going. Why? 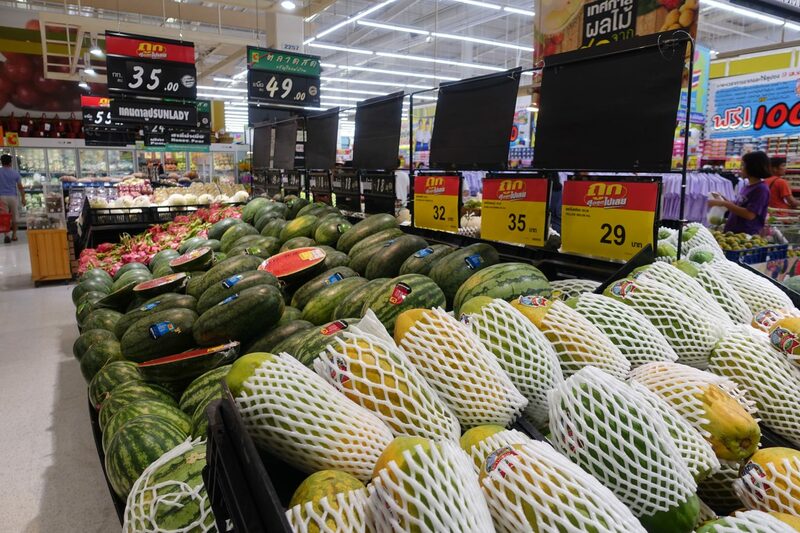 While the supermarket is high-end and I definitely wouldn’t do my weekly grocery shopping there, it’s great for sampling local fruits and snacks. 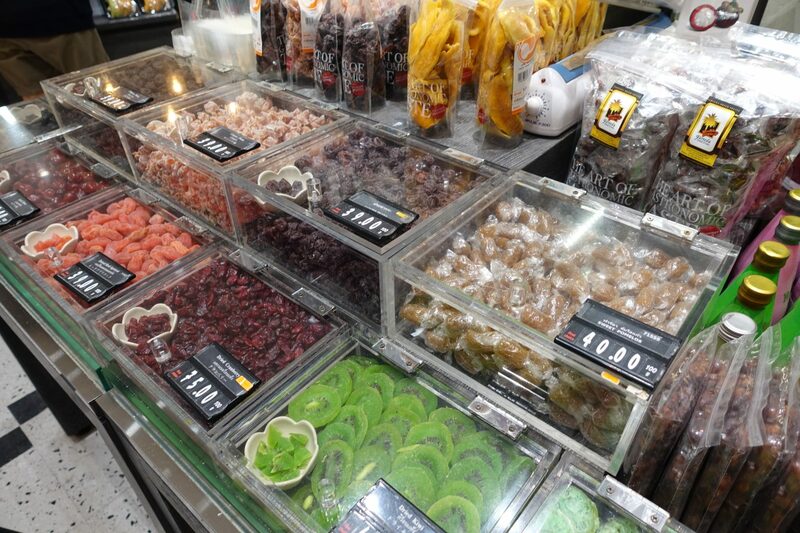 They have a big selection of dried fruits and you can sample almost all of them. If you are looking for an eatable souvenir, then this market is for you. Villa Market is a high-end grocery store with several locations in Bangkok. They have delicious peanut butter for under 70 THB and a small selection of locally made vegan cakes for roughly 60 THB each. 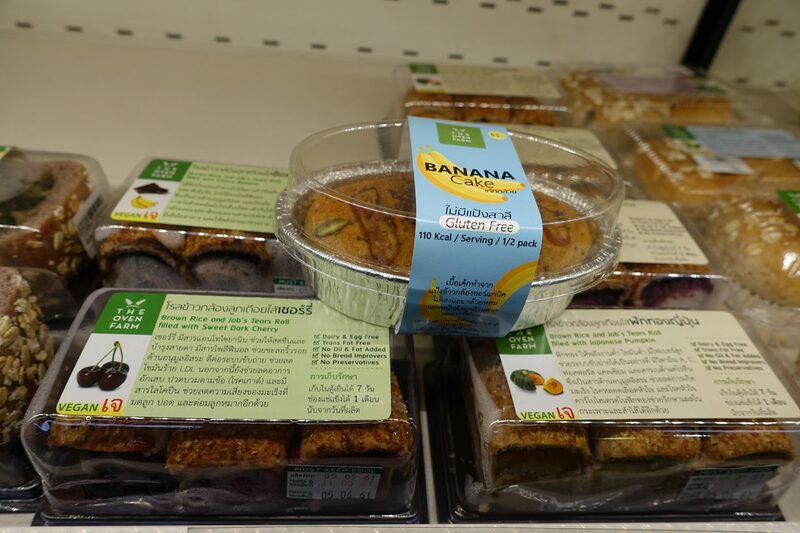 If you are looking for items such as dark bread, peanut butter or vegan sweets and snacks, then check out Villa Market. I highly recommend checking out the Vegans of Bangkok Facebook Group. It’s a small group, with just a little over 1,000 members and yet it’s a very active one. It’s perfect if you need advice on the best restaurants or are looking for something specific and are not sure where to go. For a list of Thai, desserts head to Migrationology. While not all of his recommendations are vegan, a whole lot of them are. While finding vegan food can be a little tricky, all it takes is a little research. If you go someplace new I highly recommend carrying a snack with you in case you don’t find something suitable to eat. That’s what I did and it helped me out a lot! 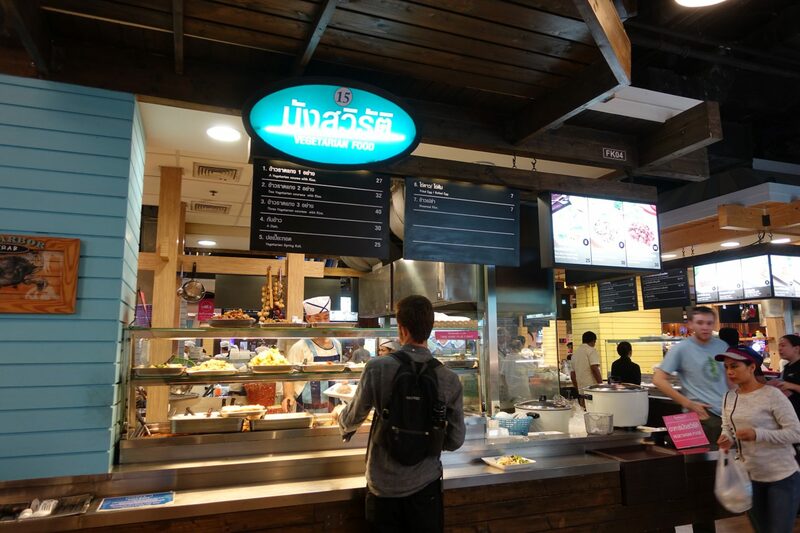 What are your favorite places to grab food in Bangkok? I’ll definitely be back and would love to hear your recommendations! 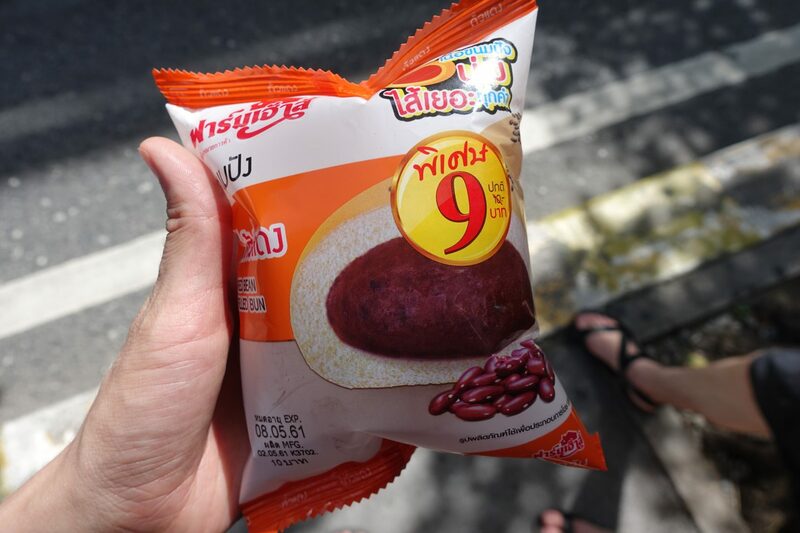 Hi Nina, I’m in Thailand atm and just checked 7-11 for the Red Bean Bun but all of them contain margarine, which often contains milk derivatives or animal fat. I couldn’t find anything online unfortunately. Did you message the manufacturer or how did you find out that it’s vegan? Thanks for your reply, Nina 🙂 What I meant though was, that the ‘magarine’ itself is the questionable ingredient. Margarine is often made out of animal fat and/or milk derivatives. I posted as well in the Vegans of Bangkok FB group and they told me that during the vegetarian festival some of those buns are labelled with the Jay sign but only during this time and that’s why they don’t buy them if it’s not the festival. Kinda confusing isn’t it?